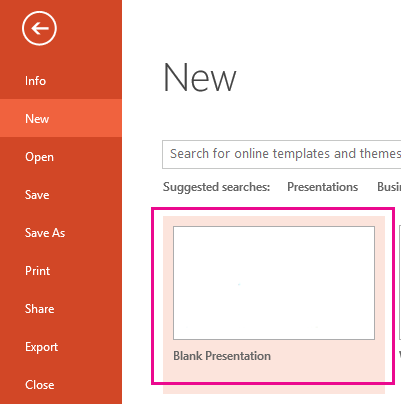 If you have a particular PowerPoint slide that you want to use in different presentations, you can save it separately from the rest of the presentation. This article describes how to quickly and easily to move your slide from one presentation to another. You can also save a slide as a JPEG image that you can use in other applications. In the Slide tab, to the left of your presentation, select the slide you want to save. Note: If you don’t see the Slide tab, click View > Normal. Tip: You can also right-click your slide and click Copy, or use the keyboard shortcut Ctrl + C to copy your slide. Click File > New. Click Blank Presentation. Click Home. Click Paste to open the drop-down menu, and click the Keep Source Formatting icon. This will paste the slide to your new presentation as the second slide. 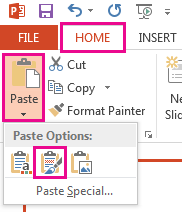 Tip: You can hover over the Paste icons to see what each paste option does. Select the blank slide in your new presentation. Click Home > Cut. Note: You can also right-click the blank slide, and click Delete Slide. You can also press Delete your keyboard. Click File > Save. Select where you want to save your slide. Find frequently used locations under the Current Folder or Recent Folders options. Click Browse to find a folder that's not listed under the Current Folder or Recent Folders options. Type the name of your slide image in the File name text box. Click Save. Click File > Save As. 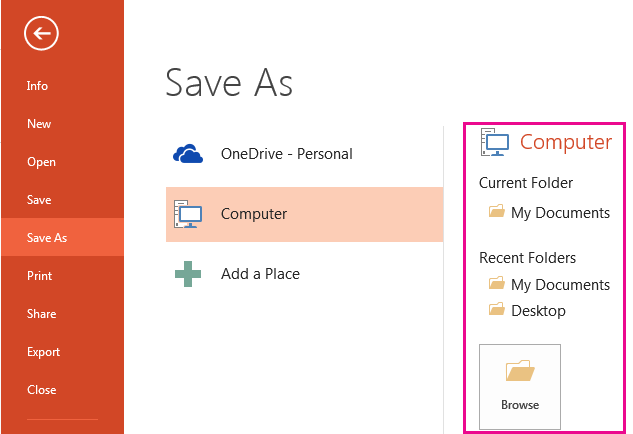 Select where you want to save your slide, either by selecting the Recent Folder option, or click on Browse. Type the name of your slide image in the File name text box. Click to open the Save as Type drop-down menu. Select one of the following image formats for your slide. 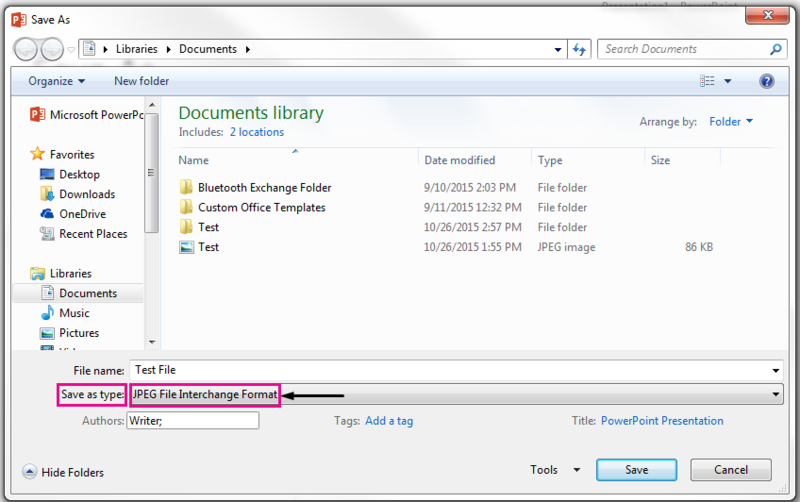 Select JPEG File Interchange Format for a .jpg file. Select PNG Portable Network Graphics Format for a .png file. Select GIF Graphics Interchange Format for a .gif file. Click Save. Review the PowerPoint dialog box, and select Just This One to save your selected slide as an image. Note: You can select All Slides to save each slide in your presentation as an image. Each slide will be saved as a separate file.